For mountain climbers, reaching Mt Everest is the ultimate claim to fame. 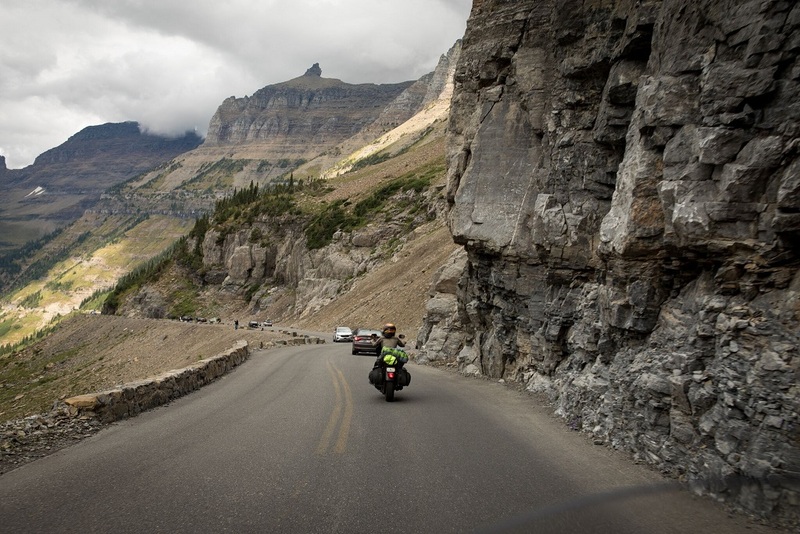 For motorcyclists, Going-to-the-Sun Road is the Mt. 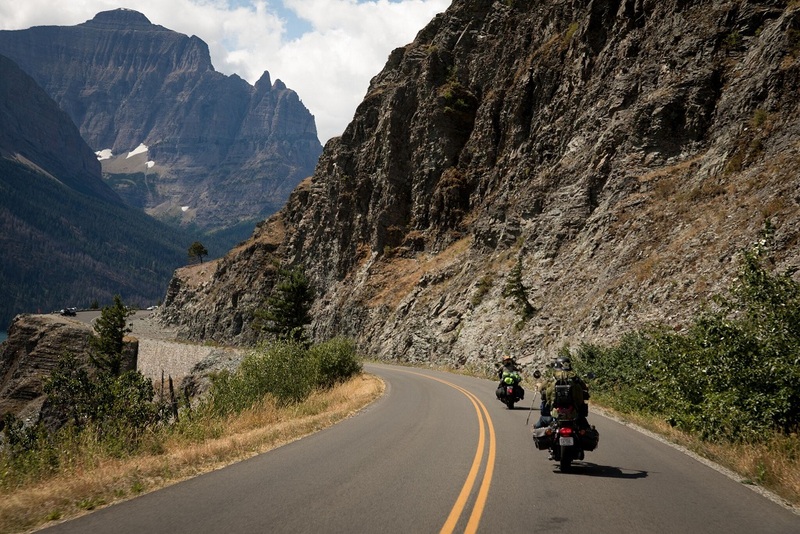 Everest of motorcycle rides in the continental U.S. Like Everest, it’s not easy to get to, it’s not always passable and it provides some of the most challenging climbs in the world, boasting some of the more sinister turns and elevation changes of any paved road in the country. Going-to-the-Sun Road was the National Park Service’s first to cross the trans-continental divide. It lies in a distant remote part of the United States in Montana near the Canadian border and because of its remote northern location, a fair amount of snow tends to collect on top. Up to 80 feet of snow can accumulate atop the 6,646-foot high Logan Pass and Snow banks as high as 8 feet can line the road at certain points as late as July and August. Consequently, it’s one of the most difficult patches of asphalt in North America to snowplow come springtime–taking crews two months in the late spring/early summer to simply clear the road for travel. 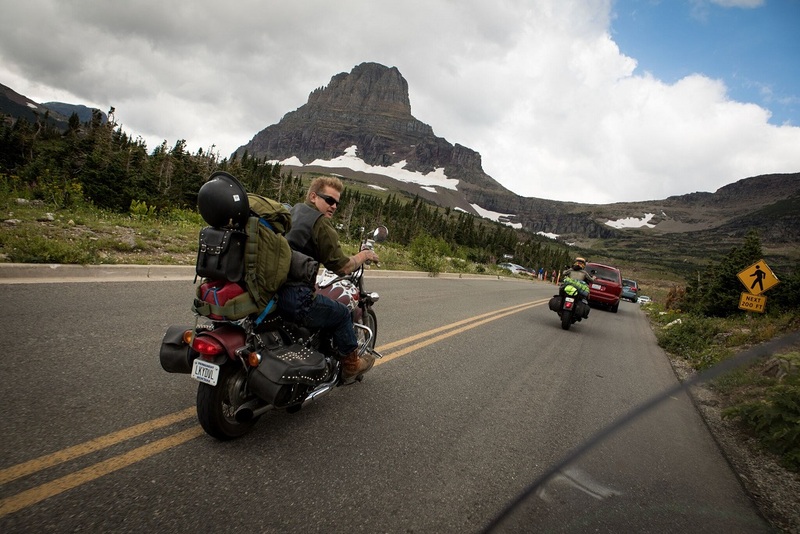 On a whim my boyfriend and I and the photographer of these photos, Preston Burroughs, decided to ride to Glacier after the 77th Sturgis rally, only a 700-mile stretch between us and what I now consider the most beautiful place on earth. Along the way we picked up a friend and rider, Abram Boise. The ride there was nothing short of beautiful; I don’t think anyone could ever say a bad thing about Montana’s landscape– but it was nothing compared to what was in store for us when we reached the National Park. 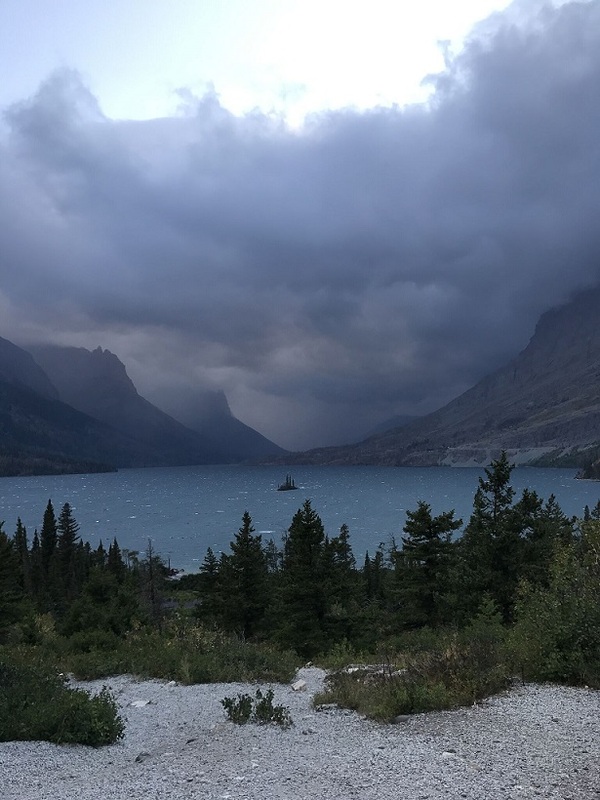 We got in just before sunset and set up camp at Chewing Black Bones, a native Blackfoot tribal campground on the lower Saint Mary Lake at the base of Glacier National Park. There are plenty of places in the area to stay but if you are going to have a real experience then this is the place I suggest. The spiritual land has a permanent Tipi village you can can sleep in, if you decide not to set up your tent. Plus it offers a glimpse of what Rocky Mountain life might have been like before you and I were born, while providing a movie set backdrop to what already seems unreal. The sun was beginning to set, so we jumped on our bikes and road just 6 miles into the park to Goose Island, a place that was so authentic it looked fake. There had been a forest fire a few days before so the sky was blanketed in a grey haze. 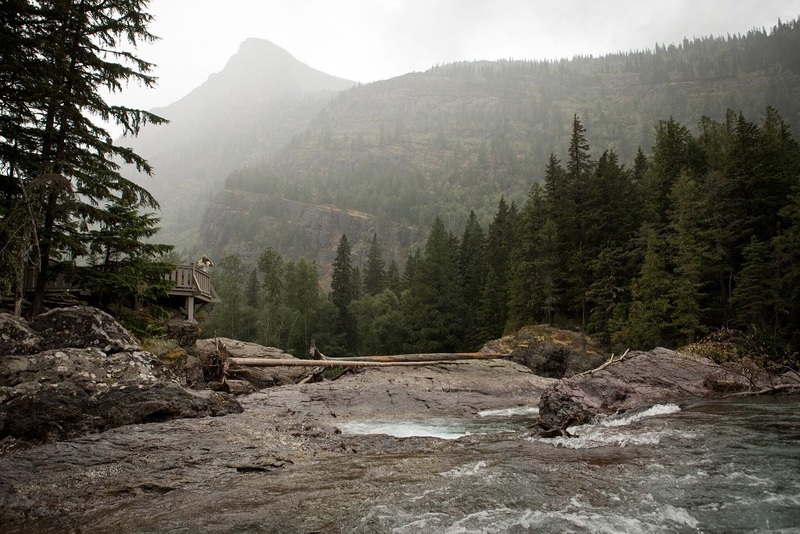 There were bits of a crimson fire sun peaking over the snow capped mountains, blue glacier water flanked by evergreens, with patches of wildflowers, alpine mosses and ferns stretching across the forest floor. It’s a awe-inspiring scene impossible to adequately describe in words or capture in photos. The entire time standing there felt more like I was watching a real life painting than visiting a location. The sun and shadow revealed new definitions of beauty that I never knew existed and made me even more excited to ride deeper into the park the next day to see what else I would find. Starting out in St. Mary, you get to take in the incredible 4,500 ft peaks that rise above the surface of Lake McDonald into that ‘big sky’ that Montana is famous for. Even though we stopped at Goose Island again, I greeted it with the same overwhelming sense of excitement that I did the day before, realizing that it’s possible for a place to be so monumental that it never gets old. As the road continues its’ steady ascent, cedars give way to towering clusters of firs. Past The Loop is the Garden Wall. This sheer cliff shoots up more than a thousand feet, forming a spine that makes up part of the Continental Divide. Water falling to the west of the divide drains toward the Pacific Ocean, while precipitation to the east eventually flows to the Atlantic. 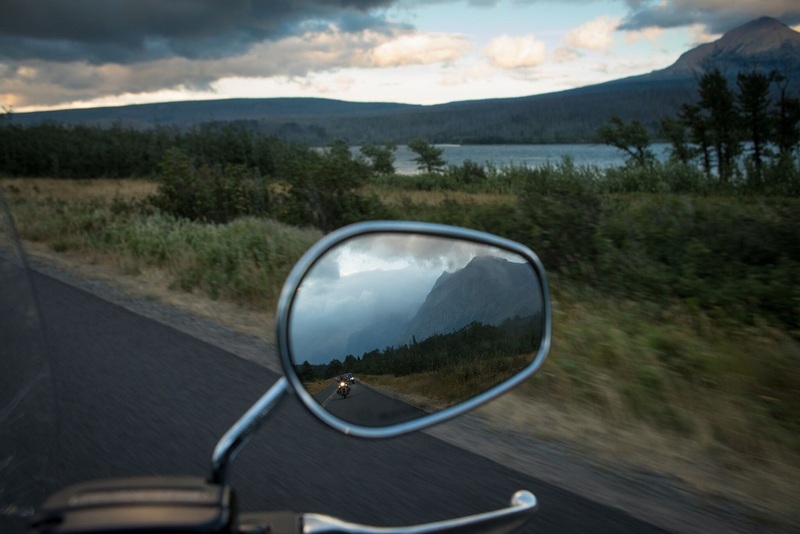 Next you will ride along a section known as Logan Pass along steep cliffs that line the roads edge and demand you keep track of the road, despite the magnificent scenery. A waterfall actually flows down off the uphill side over the road and into the river, so don’t go with it over the edge! Logan Pass is known for its beautiful wildflowers and mountain peaks. Pull over and take it all in. You have now climbed 3000 feet from Lake McDonald. The valleys spread out below you, and incredible vistas spread out in all directions. There’s a visitor center here as well, just be aware that everyone stops here and parking can be limited. While at the visitor’s center you can opt to take a short 1.5 mile hike on the boardwalk trail to Hidden Lake Overlook, another real life painting. Slowly making your way down the east side, you’ll pass the Jackson Glacier Overlook, where you can probably take off that extra sweatshirt. There’s a section of the road called The Weeping Wall. A waterfall cascades 100 feet down, over the rocks and onto part of the road so proceed with caution as the other side is over a 4500 foot cliff drop-off. Regardless of how scary this may all sound, it’s not every day that you get to ride under a waterfall surrounded by nature’s wonders, all while riding to the sun. This is an unmatched section of road. You will see jagged peaks, crystal mountain lakes, immense glaciers, unbelievable valley views, waterfalls, alpine wildflowers, meadows, streams and even wildlife… all while dodging water, weather, possible falling rocks, steep drops, twisty turns and a steep grade on the descent. So yeah, it’s challenging, but good things are never easy. But for all its scenic wonders, the Sun Road experience is not without a few negatives: The road is undergoing a multi-year rehabilitation project, so construction delays can be torturous. The speed limit is a buzz-killing 40 mph and much of the ride quality depends on the crowds. If you can ignore the traffic or get out early, you’ll enjoy the turns, climbs and waterfalls in a more relaxed mode. Also, keep in mind that the weather is a major factor up here. If you plan on making the trip any other time than the middle of summer, you would be very foolish not to make a few phone calls and make sure the roads aren’t snow-covered. Overall, the roads are in good shape, well-maintained with tons of places to pull over and sit and watch or explore the surroundings. Along its eastern end, Sun Road parallels Saint Mary Lake and takes you back to Saint Mary’s Visitors Center. This impressive ride goes from one end of Glacier NP to the other, crossing through one of the more breathtaking sections of the Rocky Mountains. It is only 50 miles long but there is no shortage of pullouts to stop and take it all in or go on a hike . The scenery is among the best in the world and you will not be disappointed. The road slinks through almost every type of terrain, from lowland glacial lakes to alpine tundra. On this trip you’ll want to make sure to bring plenty of film, warm clothing, and your hiking boots. 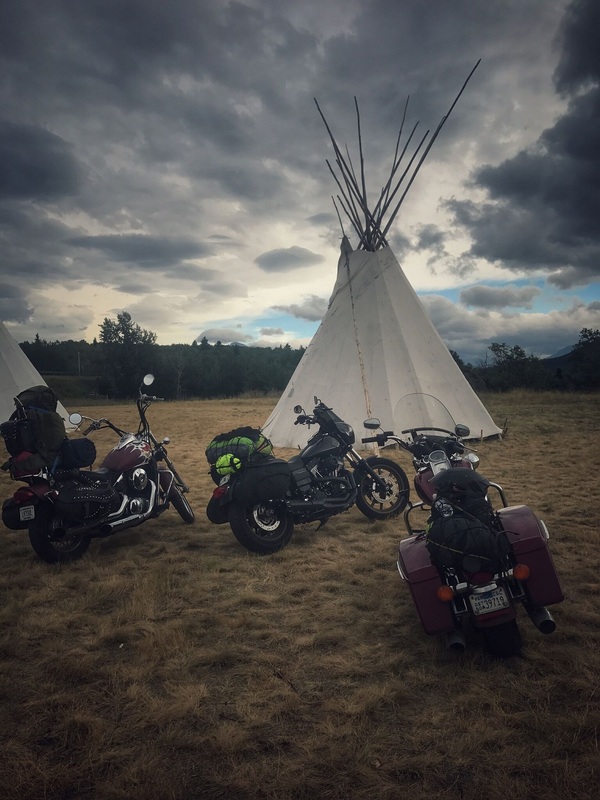 This route covers a remote area of Montana and if your looking for urban amenities (such as restaurants, craft shops, etc) you will not have much luck. The end of the drive takes you into West Glacier, MT, a town that’s very touristy. After you pick up your souvenirs, head over to Glacier Distillery and get a flight of their Ryes and whiskeys, you deserve it! It’s a great way to celebrate the completion of the most beautiful ride of your life. If there’s time once you’re fully sober, head west on Hwy 2 about 13 miles and you’ll see the “House of Mystery” on the right … it’s a place where supposedly there is a vortex that causes things like marbles to role up hill and brooms to stand on their own. Further down the road there is a place with a huge wooden maze for humans to try to get through. Also, the town of Whitefish has a great lake with a public beach if you want to hang out and enjoy a swim. If you really want to push this experience, you can head just a few miles over the border and experience the Canadian Glacier NP. That’s next on my list…I hear it’s even more grand than the one here in the U.S. Overall I would not suggest this road for the faint at heart or inexperienced riders, but it’s also one you can not miss. Just take it easy, ride smart and enjoy your surroundings. There are plenty of other roads where you can stretch your heavy wrist and open it up for a more racing type of ride. This is a place to be savored and a place to come back to again and again. Of all the things I rode away with, the top one was a new mission to discover more wondrous spaces and to get back to the basics. After all, that’s a huge reason why we ride…for freedom and to reconnect with the land. We are the modern day pioneers. We are just on a different kind of steed and there are still so many parts of the world left to discover. I would love to ride a bike. It gives me such a free-of-everything feeling. Though that is one dangerous road to ride a bike, I don't think I could ever go there to ride a bike. We would appreciate kid appreciate it with the work you will get designed this data. I really hope precisely the same very best conduct caused by anyone sometime soon in unison. Right now at the moment simply click together with follow-up cash advance costa-mesa Appreciate it with the beneficial write-up. It has set a historical benchmark in US economic history. Since February, 2009, with ARRA $13 billion of business lending $500 loan funds are offered by SBA to support small ventures. These are the current views by President to enlighten US economy indirectly. So, all you small entrepreneurs get ready to achieve Guaranteed payday loans no matter what big . Your big entrepreneurship dreams are what that will take you to newer business heights. No matter to which category a business belong, if you have sound plan the it is not difficult to get a business speedy cash wichita ks in Los Angeles. Especially, there are several loan programs for women as well as minority based businesses. US economy is greatly raised by women and minority entrepreneurship. That’s why president administration has launched extended SBA loans for these countries in this year. This will be based upon (but not solely constrained to) ratios analysis of the last two years figures (which should be obtained from the last set of financial statements). Each ratio should have payday loans near me no credit check details of how the calculation has been made in the appendices. You should have copies of the Income Statement, Statement of Financial Position and Cash Flow Statement for the latest year (also in the appendices). These should provide sufficient reference for the calculations but if not then copies of other notes to the financial statements can be provided. 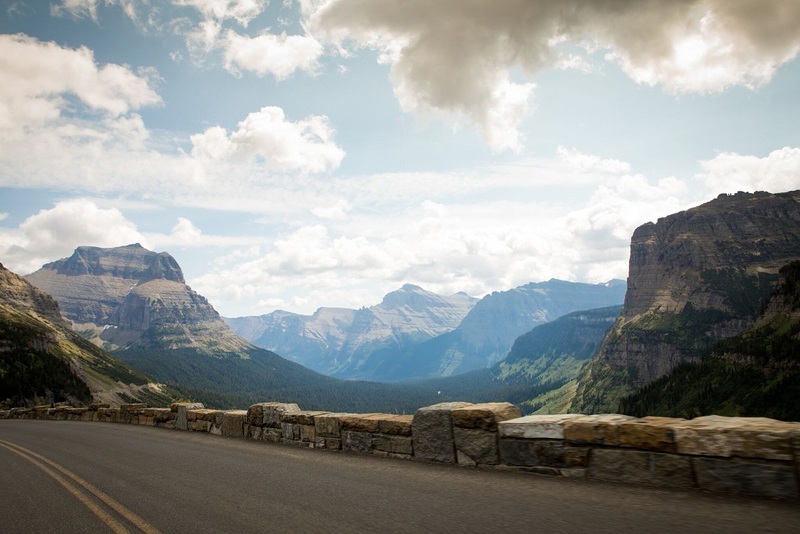 Going-to-the-Sun Road was the National Park Service’s first to cross the trans-continental divide. It lies in a distant remote part of the United States in Montana near the Canadian border and because of its remote northern location, a fair amount of snow tends to collect on top. Up to 80 feet of snow can accumulate atop the 6,646-foot high Logan Pass and Snow banks as high as 8 feet can line the road at certain points as late as July and August. At whatever point I visit here I discovered some new stuff which I truly require. I adore your online journals a debt of gratitude is in order for sharing me such a pleasant sort of web journals and post. Great job and keep it up much appreciated. Most elevated able expert of the nation has found a way to avert or wipe out abuse or occupation as quickly as time permits in the entire territory and to successfully implement the regard of natural. Home Depot Associate daily use MyTHDHR to look at mythdhr your schedule. Its most accessed feature is the “View Your Schedule” tool within the website. Sb Game Hacker for Android is a game modifying tool which you will find easier than any other game modifying tools. SB Game Hacker app helps you to get unlimited Lives, Gold, Money, etc on the games you play. The Burger King requires to know what their customers feel or thinking about visit experience. Burger King Guest Satisfaction Survey is helpful for improvement in Burger King Restaurant Services. Impressive Post. Thanks for sharing with us. keep posting like this. Extraordinary stuff and Wonderful and really rich substance and incredibly supportive data I got it my answer as of here. I amazingly prompt my companion's circle. You're the best. If your router IP address is different from 192.168.l.254 login you need to refer to a corresponding router manual to find its default login information and instructions on how to administer it.